Abstract: My research is on the development of the horse as a status symbol in Western Europe during the Middle Ages. Horses throughout history are often restricted to the upper classes in non-nomadic societies simply due to the expense and time required of ownership of a 1,000lb prey animal. However, between 1000 and 1300 the perceived social value of the horse far surpasses the expense involved. After this point, ownership of quality animals begins to be regulated by law, such that a well off merchant or a lower level noble would not be legally allowed to own the most prestigious mounts, despite being able to easily afford one. Depictions of horses in literature become increasingly more elaborate and more reflective of their owners’ status and heroic value during this time. 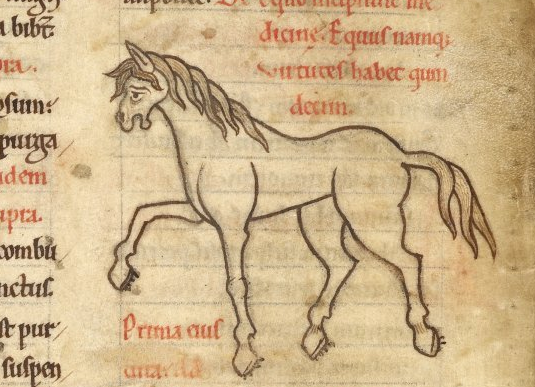 Changes over time in the frequency of horses being used, named, and given as gifts in literature from the same traditions, such as from the Waltharius to the Niebelungenlied, and the evolving Arthurian cycles, show a steady increase in the horse’s use as social currency. Later epics, such as La Chanson de Roland and La Cantar del Mio Cid, illustrate how firmly entrenched the horse became in not only the trappings of aristocracy, but also in marking an individuals nuanced position in society. Introduction: Horses throughout history have often been restricted to the upper classes in non-nomadic societies, simply due to the expense and time required of the ownership of a 1,000lb prey animal. However, between 1000 and 1250 CE, the social value of the horse surpasses the expense involved in their upkeep. After this point, ownership of high-class animals begins to be regulated by law, such that a well off merchant or a lower level noble would not legally be allowed to own the most prestigious mounts, despite being able to easily afford one. After roughly 1250 CE, horses also become increasingly differentiated in type, with each type signifying a different station in society. Literature is the richest source for evidence of these changes, as it allows insight not into reality, but rather into the ideals held by society. Early literary references (generally, pre-eleventh century) may be as plain as saying that the hero mounted or dismounted from the saddle. Later works increasingly name horses and give them descriptions and actions of their own. In the tenth century, there was little differentiation between types of horses. By the thirteenth century there was a wide variety of types, and each was associated with specific roles in society. As with most things, the literature of this time shows an extremely stylized version of reality. These types of horses, such as classes of warhorses, palfreys, or packhorses, became tied to class: a lord’s courser was vastly different from a farmer’s plough horse.